3월입니다. 벌써 5번째 이노진으로 여러분께 인사드립니다. 많은 성원과 관심 감사드립니다. 2월 한달 동안 저희 스탭들은 곧 다가오는 이노비의 베네핏 콘서트 준비와 대표님께서 이노비의 한국 공연을 준비하시기 위해 한국으로 출장가신 1달동안 사무실을 재정비하고 즐겁게 일을 하며 보냈습니다. 2월 25일에는 퀸즈에서 암환자들을 위한 콘서트를 성공적으로 마치기도 했습니다. 눈발이 날리는 추운날씨에도 불구하고 와주신 모든 분들께 깊은 감사를 드립니다. 3월 31일로 정해진 , 앞으로 1년간 이노비의 활동을 위한 모금 음악회에 많은 분들의 관심과 후원을 정중히 부탁드리겠습니다. 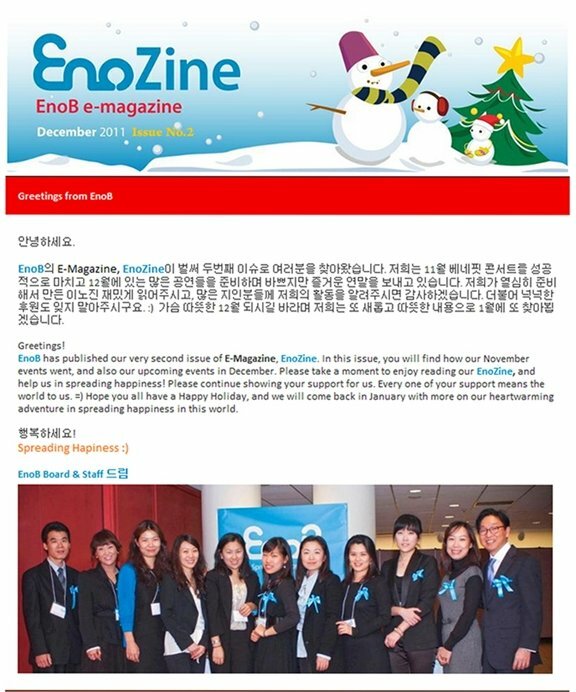 이번호 EnoZine도 재밌게 읽어주시고 행복한 3월되세요! 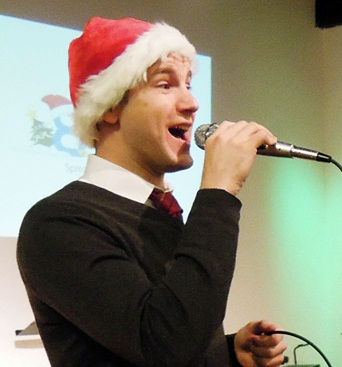 Last month, we spent some time to review and assess our performance as an organization, and also were able to bring about our 'Joy & Comfort through Music' concert at the Bowne Street Community Church. We would like to give our special thanks to all who came to support our cause and us that day. We are also pleased to announce our first benefit concert of the year. More information about the concert is provided below. 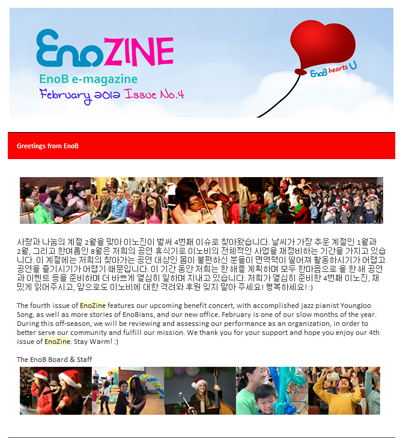 We thank you for your support and hope you enjoy our March issue of EnoZine. 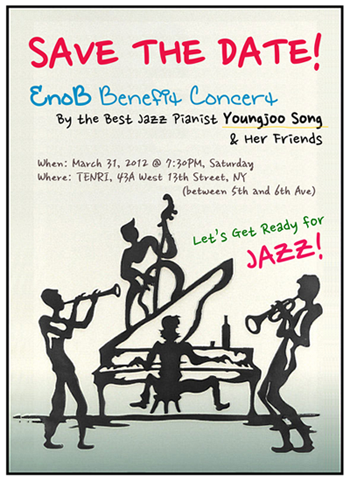 이노비 후원을 위한 Benefit Concert 가 3월 31일(토) 7:30pm 에 열립니다! Jazz Pianist 송영주씨와 함께 수준 높은 뉴욕의 Jazz Musician 들이 참여하여 이노비 후원을 위한 Jazz Concert를 엽니다. 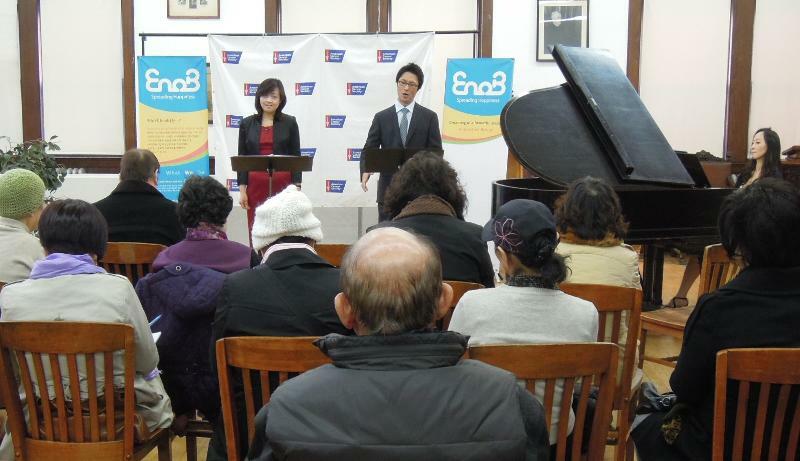 EnoB Benefit Concert의 모든 수익금은 평소 몸이 불편하거나 경제적인 어려움 등으로 인해 live음악을 들으러 갈 수 없는 분들에게 직접 찾아가 무료 음악회를 열어드리는 이노비의 사업을 위해 사용됩니다. 3월 31일, 최고의 Jazz 음악도 즐기고, 이노비의 선한 사업에 힘을 더해주실 수 있는 일석 이조, EnoB's Benefit Concert 많이 찾아와 주세요! 이번 Benefit Concert에 광고후원을 받고있습니다. 관심있으신 분은 이노비로 연락 주시기 바랍니다. We would like to invite you to our first benefit concert of the year, which has been rescheduled for Saturday, March 31st. 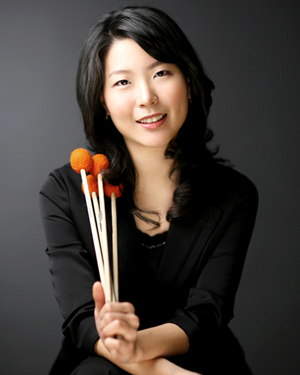 The concert will feature YoungJoo Song, one of Korea's leading jazz pianists, as well as other jazz musicians. All proceeds from this benefit concert will be used to enable EnoB to deliver more live performances and events to the community. 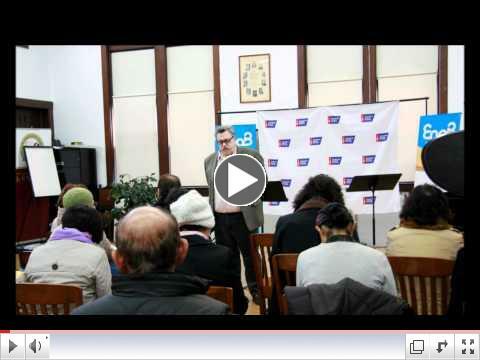 please contact us at becon@enob.org or call 212-239-4438. 2월 25일, 이노비는 미국암협회(ACS) 아시안지부의 모임이 있는 Flushing의 Bowne Street Community Church에 찾아가 한인 암환자분들을 위한 음악회를 열었습니다. 이 날 공연에는 바리톤 박요한, 소프라노 오선영, 피아니스트 전성혜님께서 오페라 곡과 뮤지컬 곡, 한국 민요 등 환자분들께 친숙한 음악을 들려 환자분들의 뜨거운 박수를 받았습니다. 이노비 공연에 참여하신 분들의 소감을 전해드립니다. "음악은 암환자들의 감정과 동기를 효과적으로 조절하는 데 중요한 것이라 생각되어 음악회를 기획하게 되었습니다. 환자분들이 암치료 중 정서적 도움을 위해 어떠한 활동을 하느냐에 첫 번째로 기도, 그리고 음악감상 이라고 언급을 하십니다"
아래 날짜를 클릭하시면 이노비의 2월 신문기사를 보실 수 있습니다. 지 난 2년간 이노비와 함께 공연을 하며 나눔의 기쁨과 행복을 전달하고 있는 폴은 뉴욕대에서 공부를 마친후 브로드웨이와 오프브로드웨이 무대에서 활약하는 뮤지컬 배우이자 가수입니다. 뉴욕대학에서 가르친 경험이 있고 여러 비영리단체를 통해 다양한연령의 아이들에게 음악을 가르치고 있습니다. 이 노비에서 공연하는 것이 다른 단체들과는 다르게 더 가까이에서 아이들의 즐거움과 반응을 느낄 수 있기 때문에 보다 값지게 느껴진다고 합니다. 뮤지컬 공연을 직접 보러 올 수 없는 아이들에게 노래를 불러주고, 또 평소에는 접하기 힘든 라이브음악을 보여주는 일을 하는 이노비의 활동을 더 많은 사람들이 알고 또 참여했으면 좋겠다고 합니다. 이노비의 모든 공연이 좋지만 그 중 가장 좋은건 일년 중 가장 기쁜 한 달인 12월에 몸과 마음이 아픈 아이들에게 찾아가 공연하는 크리스마스 아웃리치 공연이 좋은 것 같다는 폴, 앞으로도 이노비와 함께 더 많은 아이들에게 웃음꽃을 피우게 하는 노래를 들려주었으면 좋겠습니다. 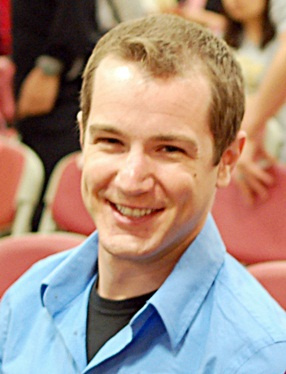 2007년 EnoB의 장애우들을 위한 프로그램인 Let's play with music에 오셨던 것을 시작으로 이노비와의 인연을 맺으시게 된 이노비 서울의 유현정 이사님을 소개합니다. 유현정 이사님은 이화여자대학교 졸업하고 보스턴 대학교에서 멀티미디어 디자인 전공으로 석사를 취득했습니다. 대표적인 전시회 로는 1998: 'The Hole', 2003: 'Between 2000 and 2003', 2004: 'Hommage a Paik', 2006: 'WAVE' , 2007: 'Seoul Design Festival', 2010: 'Strange Apple', 2011: 'Museum Safari'가 있습니다. 유이사님께서는 연세대학교 재활학교에서 중증 장애우들을 위한 모임 봉사를 하고 계시고, 저소득층 아이들을 위한 디자인교육도 진행하시고 계십니다. 또, 몽골등 해외에서도 봉사활동을 하시고 컨페션- (아이를 양육하는 봉사 프로그램)등 많은 봉사와 나눔활동에 참여하고 계십니다. 현재에는 이화여자대학교 영상디자인학과 교수로 재직 하시면서 앞으로 이노비가 음악뿐만 아니라 음악과 미술이 접목된 다양한 활동으로 정서적인 치유의 다각적인 접근방법을 개발하시는데 도움을 주고 싶다고 하십니다. 5년전부터 꾸준히 아낌없는 봉사를 하고있는 이노비가 부럽기도하고 존경스럽고, 누구보다 자랑스럽다고 말씀을 끝맺으시면서 격려를 해 주셨습니다. 이노비가 앞으로 나아가는데 환한 빛이 되어주실 유현정 이사님께 미리 감사의 말씀을 드리고, 또 앞으로 더 많은 격려와 사랑 부탁드립니다. 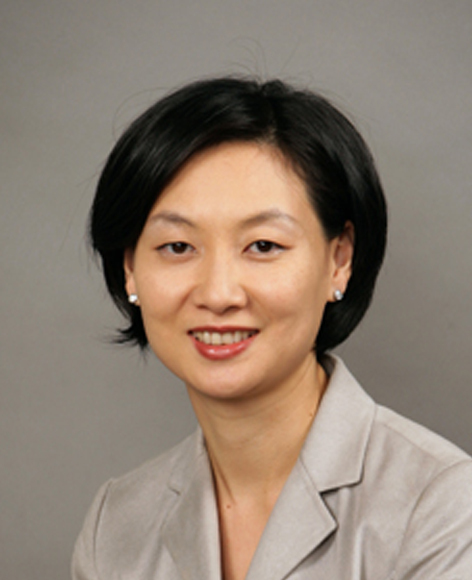 Hyun Jung Yu is a new member to our Board. We first met Ms. Yu during our 2007 'Let's play with Music' program. She received her Master of Fine Arts in multimedia design from Boston University and her Bachelor of Fine Arts in visual communication design from Ewha Woman's University. With her great talent and skills, she was part of many solo and group exhibitions. To name a few, 'The Hole' in 1998, 'Between 2000 and 2003' in 2003, 'Hommage a Paik' in 2004, 'WAVE' in 2006, 'Seoul Design Festival' in 2007, 'Strange Apple' in 2010, and 'Museum Safari' in 2011. 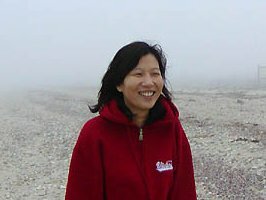 She is currently working as a professor at Ewha Woman's University and lives happily with her husband and two children in Korea, and is extensively involved with and volunteers for various children's causes. Her goal is to use music and arts to help heal the minds of children. 이노비와 함께하게 된 새 스탭을 소개합니다! 박선영 매니저님은 5살 때부터 피아노를 치기 시작해 선화 예술 고등학교에서 작곡을 전공했습니다. 이화여대에서 작곡을 전공하고, 이 후에 음악으로 사람들을 치료하는 음악 치료 분야에 관심을 가지게 되어 한국의 이화여대와 미국의 뉴욕대학에서 음악 치료 석사 과정을 마쳤습니다. 박선영 매니저님은 뉴욕에서 공부하는 동안 악기를 이용한 즉흥 연주를 기법을 개발하여 음악을 통해 자신을 표현하는 방법을 터득하여 현재 뉴욕에서 연주자이자 작곡자로 활동하고 있습니다. 몸과 마음이 자유롭지 못한 분들에게 다가가 음악을 통한 치유를 경험할 수 있는 좋은 프로그램을 많이 개발해 주시길 부탁 드립니다. Ms. Park began playing the piano at the age of five and went to SunWha Art High School, majoring in composition. She further studied composition at Ewha Woman's University. Later she got interested in psychology and how music can heal people, which led her to the music therapy field. She obtained a Master's degree in music therapy at Ewha Woman's University, as well as at New York University. While at NYU, she further developed her improvisational skills. Currently Ms. Park resides in New York working as a composer and performer. We hope that Ms. Park continues to provide excellent concerts to help heal the minds and hearts of those that are in need. 지난 2월, 저희 사무실에는 새로운 프로그램 코디네이께서 이노비와 함께 하시게 되었습니다. 바로 김보미 선생님인데요. 김보미 선생님은 서울대학교 음대에서 퍼커션을 전공하고, 현재는 뉴욕대학 Steinhardt School에서 공연예술경영학 석사 과정 중에 있습니다. 음악교사 자격증도 가지고 계신 김보미 선생님은 이노비의 사업에 감동을 받아 조금이라도 도움이 되고 싶어서 이노비에서 일을 시작하게 되었다고 합니다. 앞으로 이노비에서 본인의 역량을 맘껏 펼치시길 바라며 보미선생님의 도움으로 이노비가 더욱더 완성도 있는, 더 많은 사람들의 가슴속에 영원히 기억될만한 프로그램을 마련할 수 있도록 많은 응원과 격려를 보내주세요! 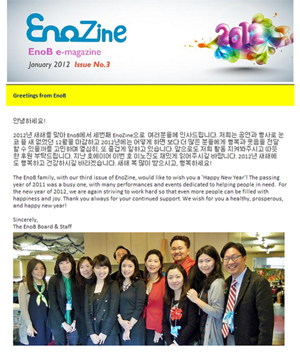 Our new program coordinator, Ms. Bomi Kim, joined EnoB this past month. She obtained her bachelor's degree in Music (percussion) from Seoul National University, and she is now pursuing a master's degree in Performing Arts Administration at NYU. 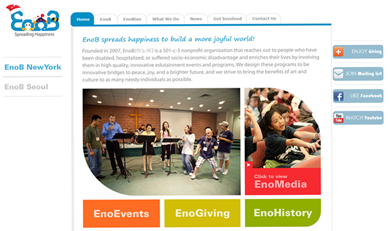 Ms. Kim, who is also a certified music teacher, said that she joined EnoB after being touched by our cause. We hope that Ms Kim will be able to bring to EnoB her passion and expertise to for mutual fulfillment and benefit. 이번달에는 플러싱에 위치한 제일약국 the first pharmacy의 김광균 Kenny Kim, 양진숙 Jinny Kim 사장님을 소개합니다. 두분과 저희 이노비와의 인연은 작년 11월 이노비 베네핏 콘서트때부터 시작되었습니다. 저희가 광고 후원을 받기위해 무작정 전화를 드렸는데 저희의 활동을 소개하는 한 통의 전화에 흔쾌히 후원을 결정해 해주셔서 저희가 말로는 표현할 수 없는 큰 감동을 받았던 기억이 납니다. 그 이후에 찾아뵙고 인사도 드리고, 말씀도 듣고 했을때 저희는 두분의 장애우에 대한 큰 사랑에 놀라지 않을 수 없었습니다. 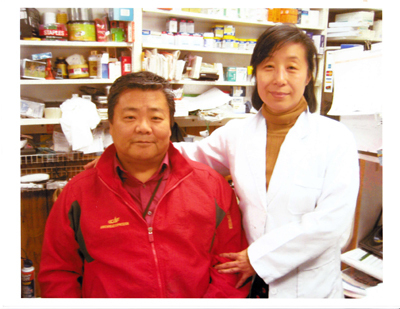 In this issue, we would like to show our thanks to one of EnoB supports at The First Pharmacy, in Flushing Queens. 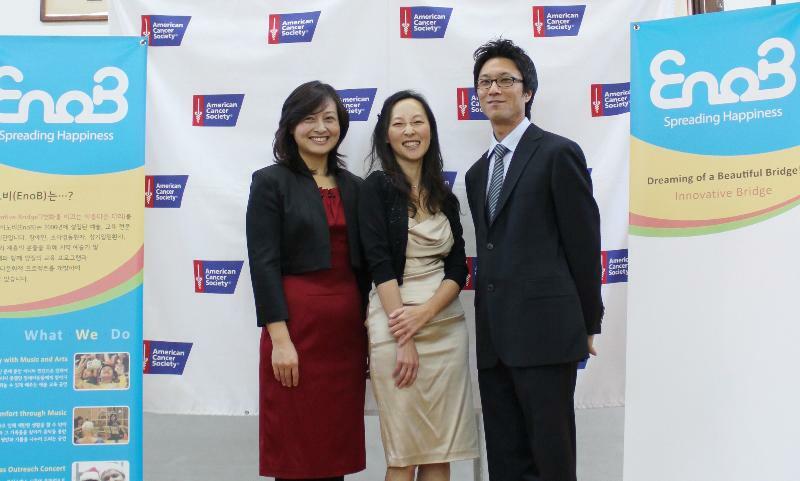 We first met Mr. Kenny Kim and Jinny Kim through our benefit concert in November 2011. We were thankful that the First Pharmacy had purchased an advertisement in support of EnoB. Subsequently, we were able to meet with them again at their Pharmacy and were happy to discover how strongly they cared for and supported our disabled friends. Through their own very personal experiences, both of the Kims had first hand knowledge and experience of the lives of disabled people. To this day, they continue to volunteer and support disabled people through contributions to scholarships as well as sending wheelchairs and other equipment. They believe that music has the power to touch and change people's lives, and therefore they happily support EnoB and their good works. 아래 이미지를 클릭하시면 지난호 이노진과 저희의 새 웹사이트를 보실 수 있습니다.